Every vehicle has a fuse box somewhere in the cabin, usually underneath the steering column near your feet or hidden within the glove box. These fuses are safety devices consisting of a strip of wire that melts and breaks an electric circuit if that current exceeds a safe level. You will know is you blow fuse because any of the components on that circuit will stop working, like the radio, the interior lights, or the electric side mirrors. There are a few reasons why you might continually blow the same fuse. Let’s take a look at the usual culprits. Let’s start with something simple and obvious. Be sure to check, first, that the fuse has the correct amperage rating for the circuit it is in. The vehicle’s manual should contain a diagram with this information. Check what devices or lights are on that circuit, as it may be the case that a new amplifier pulls too much power, causing the fuse to blow. The more devices there are on one circuit, the heavier the amp load. Each electric device, including headlights and radios, pulls a certain amount of amps from the electrical system. The number embossed on the fuse, such as 5, 10 or 15, indicates how many amps may be pulled through the fuse before it blows. Each wire in a car has a specific gauge or thickness. The amount and type of conductor used in a wire determines how much power it can handle before it overheats and melts. Electric devices also have these same limitations. They can only handle so much power before catastrophic failure and possibly a dangerous fire occur. Fuses protect both the wiring and the devices in the vehicle. An electrical device has failed. If a wiper motor or power lock solenoid have fried and melted on the inside, it might start drawing too much power in an attempt to keep working. This overloads the circuit causing a short and a blown fuse. Friction against a wiring harness has caused the wire insulation to fray. This exposed wire can cause a short when it touches a ground surface. This is often the cause of intermittent shorts. As the wire moves it may only occasionally come in contact with a surface that will cause a short and a blown fuse. Any connector that gets exposed to the elements could cause a short circuit. If you a leak that is soaking your carpets it could cause a wet wiring harness. A wet harness can corrode over time causing an eventual short circuit and many blown fuses. To see if a fuse has blown, the first step is to consult the owner’s manual. The location of the box and the assigned circuit for each fuse should appear in a diagram in the manual. 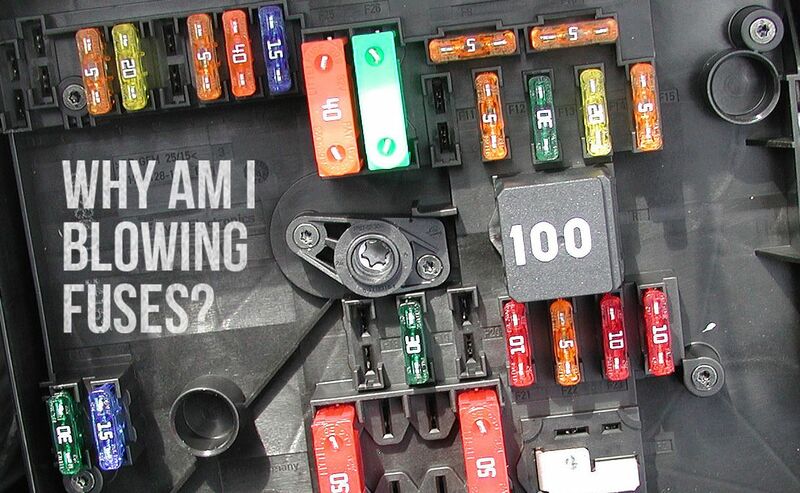 Most newer cars allow removal of the fuse box lid by hand or with a flat head screwdriver. Some fuses are designed to come out by hand, while others require a pair of tweezers or a smaller pair of needle-nose pliers. Inspect each fuse visually, and replace as necessary. They only cost a few cents and it is a good thing to know how to do. They can be purchased from any car parts shop or hardware store. how about the risky connection of electric wires in the car (e.g) connecting left lights by taking energy from the right lights! Hi Joe, all questions for our techs should go through our contact page. We will get back to you the same day. Thanks! My interior lights fuse blew while giving a boost. But it keeps blowing when I attempted to replace it. What am I doing wrong. Tough to say. Give us a shout through our contact page and we can get some more details. Every time I change it and try putting the car on reverse/drive it burns the fuse. My ’12 chevy cruze keeps blowing the ac fuse. The relay is still clicking when I turn on the ac, and the ac works fine for about 5 minutes on a new fuse before it blows again. What could cause my problem? Please help!! Thank you in advance! Hi Missi, it is tough to say without diagnosing it ourselves. If you are in the area give us a call to get an appointment, and if not, find a reputable mechanic to help you! My wiper fluid pump fuse keeps blowing. The only thing that WONT turn off is my tire monitor light. Tires are fine but the sensor is shotty. As always, just contact us through our contact page for anything car repair related. Thanks!